Dubai, February 8, 2017: Making your own juice is a healthy choice. So it makes sense to choose an appliance that juices anything and extracts every bit of goodness from every ingredient. Today, consumers are becoming more conscious of what they eat and how they prepare their food. Social media is heavily populated with healthy eating topics such as juice detox smoothies, protein shakes, lean living, and insanity workouts. Retaining maximum nutrition is the thinking behind the design of Kenwood’s new juicers, PureJuice’s new range of slow press juicers and part of their Fresh Thinking campaign in advocacy for health and wellness. Not only will your 100% natural juice be healthier and will last for longer without separating into water and pulp, but you can actually see the extra goodness through the retention of vibrant colours of the fruits and vegetables. You can rely on Kenwood PureJuice to unlock the goodness in many superfoods including leafy greens like kale or wheatgrass and popular healthy ingredients such as pomegranate or beetroot. Peeled citrus fruits are no problem and you can even make your own almond milk, perfect for lactose intolerance and healthy for the whole family. The juicers are also very easy to use - You can make a large jug of juice in one go, and the clip on sieve can then be used to ensure silky smooth juice, if desired. Meanwhile the pulp container allows you to collect the fibrous pulp that could be used in cooking cakes, brownies, falafels or soups. 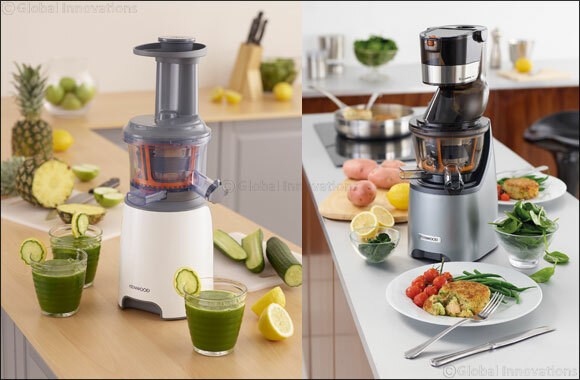 PureJuice (JMP600WH/SI) – 999AED/ With Sorbet Attachment: 1,099AED: PureJuice is Kenwood’s new Slow Press Juicer that comes in silver or white. An effortless way to engage in a healthier lifestyle through consuming 100% natural juice. By slowly crushing ingredients PureJuice can extract up to 84% of juice and retains maximum taste, colour and nutrition.